TSN has learned Toronto FC has agreed to swap striker Jermain Defoe to Sunderland AFC of the Barclays Premier League with US Men's National team striker Jozy Altidore and cash heading to Major League Soccer. The cash amount received has not been disclosed at this time but is believed to be significant. Although the swap has been completed, Altidore is not yet a Toronto FC player. Altidore played for the New York Red Bulls from 2006-08, meaning he would have to go through Major League Soccer's allocation process for re-entry into the league. Toronto FC sits sixth in the allocation rankings and the club doesn't believe any of the teams ahead of them have interest in the player (Montreal, San Jose, Colorado, Chicago, Houston). However, there is sentiment among many the league would prefer to see Altidore land with an American based team, namely back with the Red Bulls. Toronto FC wants to keep the player. But depending on how the process plays out, they may be forced into a settlement with said team ahead of them in the allocation rankings if they decide they want Altidore. Again, Toronto FC doesn't want the cash transaction; they want the player. This adds an intriguing wrinkle; if MLS head office wants Altidore in New York, they can make it happen. As sensational as it sounds, MLS could in fact play a role in Altidore landing elsewhere despite the swap deal agreed upon by Toronto FC and Sunderland. Which begs the question; how does MLS feel about having two of the top US Men's National team players both playing for Toronto? The Red Bulls are the team to watch in the coming days. If they jump up in the allocation process, they threaten the chances of Altidore joining Toronto FC while raising questions about league influence in transfer dealings. The drama and intrigue revolving around Altidore's landing spot will play out in the coming days. If all goes to plan, Altidore will be a Toronto FC player. In Altidore, Toronto FC would potentially get a player seven years Defoe's junior and a motivated striker to resurrect his club career. It is believed Altidore would sign a four year contract with Toronto FC (financial details have not been disclosed) and will be a Designated Player. Toronto FC see Altidore as a young player (25) suited to MLS having significant value in the North American game. Altidore failed to settle at Sunderland after a $10 million move from AZ Alkmaar of the Eredivisie in the summer of 2013. In 2012-13, Altidore helped AZ to their first Dutch Cup title in 31 years, scoring 23 goals in league play. Altidore is a mainstay with the US Men's National team having scored 25 goals in 76 appearances. The striker suffered a hamstring injury in the United States opening match against Ghana in the 2014 FIFA World Cup Brazil, ruining his competition. Altidore is good friend's with Toronto FC star midfielder Michael Bradley, who is said to be "very, very happy" with the pending acquisition of the striker. Altidore returns to MLS after scoring 15 goals in 37 appearances for the New York Red Bulls between 2006-08. A swap move for Defoe was always in the cards with Sunderland's need for reinforcements up top. TSN reported talks between the two clubs were progressing last Friday. The deal fell into place after additional financial considerations were agreed upon. It comes as no surprise Defoe heads back to England after just one season in Major League Soccer. Defoe, 32, preferred to be in England for personal and professional reasons. The striker joined Toronto FC last January from Tottenham Hotspur for a reported $10 million transfer fee on a four year deal. Reports out of England indicate Defoe has signed a 3 and a half year deal worth £80,000 per week ($129,000) with Sunderland. 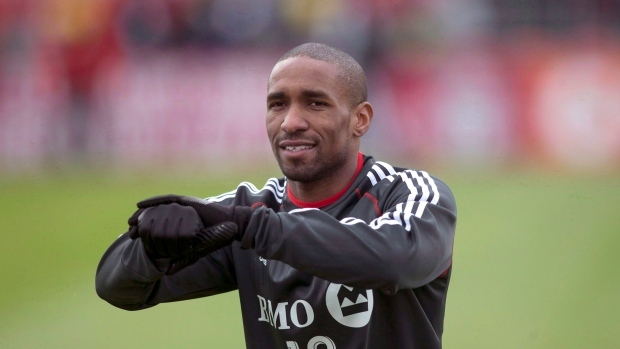 Defoe had a dream start to his Major League Soccer career scoring eight goals in his first nine games. Toronto FC established themselves as an early playoff threat. Defoe seemingly became unsettled after being left out of England's World Cup squad. A nagging groin injury and shift in focus ruined his second half of the season. Returning for treatment in England and continual questions about his future were unneeded distractions. Toronto FC didn't win a game Defoe played in after July 12th. Defoe's first and only MLS season reads 11 goals in 19 games. His two-goal opening day performance in a win in Seattle and a crucial missed late-season penalty in a home loss to 10-man Houston Dynamo will serve as the high and low points of his tenure. Sunderland win the Defoe sweepstakes with four other Premier League teams interested. The Black Cats have only scored 18 goals in 21 league games played, the second worst tally in the Premier League. Defoe joins a Sunderland team 16th place in the Premier League table, just one point out of the relegation zone. TSN can also confirm negotiations to bring Juventus attacking midfielder/striker Sebastian Giovinco to Toronto FC continue to advance and a deal is on the verge of being completed to see the Italian join Toronto FC on July 1st. A fourth designated player spot is needed for any deal to be consummated or current Toronto FC striker Gilberto would have to be dealt to open another Designated Player spot. Financial terms are close to being completed, indicated Maple Leaf Sports and Entertainment have approved an annual salary in the $7 million range. Giovinco, 27, has seen limited first team chances with Juventus this season, starting only two Serie A games. He has featured for country 20 times and would represent the type of elite playmaker required at Toronto FC. Giovinco has a superior work rate and talent to help Toronto FC bolster an attack lacking a creative spark in the attacking third. These acquisitions of Altidore in Giovinco would be a coup for Toronto FC. Both players are in their prime, bringing talent and upside to Toronto.